Are YouTube Brand Channels the Next Step in Microsites? If you’ve been in digital marketing for any length of time, you’ve probably worked on a microsite. Microsites are usually created to showcase or promote a product, contest or event. Media companies are sent off to buy (with a budget usually four times to build) banners and print ads to drive users to the site. At the end of the campaign the site is taken down, the database exported (hopefully with an armload of newsletter opt-ins), someone puts together an analytics report and you move on to the next one. But, a new wave of web applications and tools came along in the early 00s. (Does anyone have any idea what we call that decade?) We began incorporating blogs, comments, sharing and even user-generated content to the microsite. As social platforms like MySpace and Facebook began to attract a critical mass of users, companies began creating profiles and developing social media strategies to communicate with their fans—I have always hated that term, but it’s still better than “Likes”—followers and subscribers. Now, when the microsite subject comes up, the idea of creating a standalone site from scratch seems crazy. Why would you start from scratch every time when you have already built up an audience on your Facebook, Twitter or YouTube profiles? For the most part microsites have been replaced by customized tabs (which aren’t even tabs anymore, confused yet?) on Facebook brand pages. Larger companies such as Ford are creating Facebook brand pages for high profile sub-brands such as Mustang, Focus and Explorer. Dodge has hidden three of their new Journey SUVs at secret locations around the U.S. Visitors must unravel the clues to their location by closely watching the videos. If they track down the vehicle, they can claim it as their own. At Le Club Perrier, the more people that watch the videos the hotter the party gets… literally. As the number of total views increases, new videos are revealed. The winner of a sweepstakes draw will be flown to NYC for a real-life version of Le Club Perrier. In the RNZAF Step Up campaign, visitors were able to fly a simulation of a RNZAF helicopter or aircraft live over a scale model of the New Zealand countryside using keyboard controls. The site became so popular that they were forced to limit the experience to New Zealand visitors only. To promote Just Different, the new Hugo Boss fragrance for men, the company created an interactive experience that uses the viewer’s webcam to control a video experience. 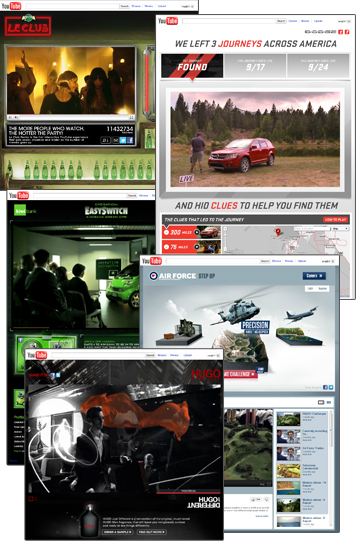 The elements in the video react depending on how the visitor tilts their head. To promote its EasySwitch campaign, New Zealand’s Kiwibank has created an experience featuring its (but fictional) GreenOps team. The elite team helps to educate frustrated customers of other banks by showing how easy it is to switch to Kiwibank. Your YouTube brand channel experience should always support your business and communication objectives. It should not be an isolated outpost, make sure you are creating links back to your website and other social profiles. There’s no substitute for great content.